OverDrive | How do locked carts work? When you lock a cart, other Marketplace users from your library will be able to view the cart's contents, but won't be able to edit them (unless they have a set of high-level Marketplace permissions). 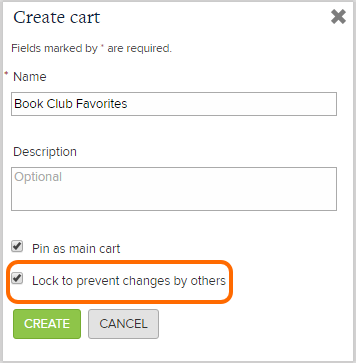 To lock a cart, select Lock to prevent changes by others when you create the cart. 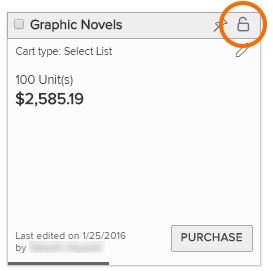 Or, you can lock a cart from the Carts page by clicking the lock icon. Carts that you lock will have a key icon and a "Private" label on the cart details page when viewed from your account. Unlock a cart by clicking the key icon (or, if you have the required high-level Marketplace permissions, you can unlock other users' locked carts by clicking the lock icon). How do I edit a locked cart? The only the people who can edit a locked cart are the person who locked the cart and users with the following high-level Marketplace permissions: Users, Library site admin (or School site admin), and Marketplace settings. If you don't have the necessary permissions to edit a locked cart, you can edit a duplicate of the cart by copying the locked cart's contents and creating a new cart.